» Bored? Try Your Hand At Human Foosball! Bored? 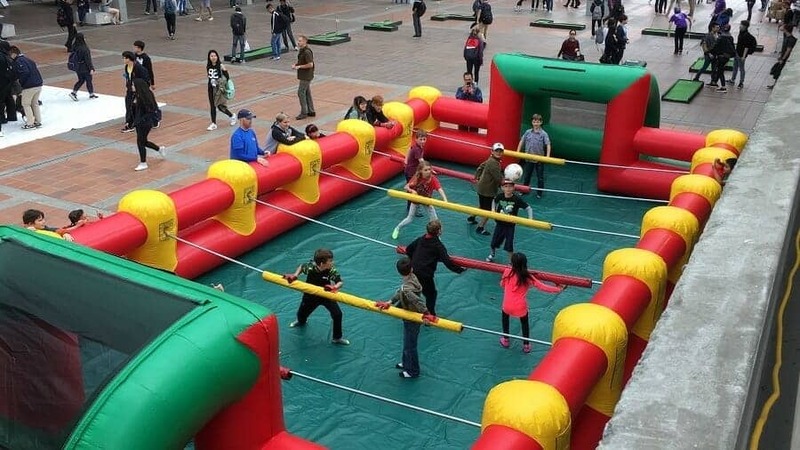 Try Your Hand At Human Foosball! If you've never heard of or seen a match of human foosball, chances are that you will soon. Nobody's quite sure when it started, but after a video of some "foosballers" went viral a few years ago, the game has since exploded. It's spread from the American Midwest all the way to countries like Dubai and India. The concept is simple; it's just a life-size version of everybody's favorite table football game. Traditionally this game is modeled after football (perhaps soccer where you're from) and has two or four players who stand on opposing sides of the game table. These players control poles to which their players-figures are attached. Using the poles, the players can move their figures laterally and spin them full circle. There are goals at each end of the table, and the ball is small and hollow, similar to a ping-pong ball. A common foosball match usually consists of two players rapidly handling their figures to "kick" the ball into the other's goal. Human foosball has almost the same rules. The spinning figurines are replaced by actual people who hold onto lateral bars which are suspended across a playing field. Players must remain on their bars the entirety of the game and are only allowed to move laterally. To start a referee tosses a soccer ball directly into the middle of the field, and the game begins. The official team sizes are 11-13 players per side, but the game can be played with less if you reduce the size of the playing field. The basic structure to follow is to ensure that each team has a goalie and a good spread of kickers on their half of the field. The usual spread of players is such that each team gets three forwards, two mid-fields, and one goalie, all lined-up in a triangle format. What Are The Rules For Human Foosball? Due to it’s rising popularity, several semi-official organizations have sprouted up and created a general set of rules for players to follow. ​Before the game starts, all rows except for the Goalie must have their bars touching the wall opposite from the referee. This process must be followed for each consecutive reset. ​The ball is live as soon as it is thrown in. ​Hands must remain on the bar at all times. As long as the ball is in play, both hands must firmly grip the bar. Removing one or both hands during play results in a penalty. No Hanging Allowed. Players may not hang or stretch out from the bar to reach the ball. Arms may be used to hit high balls. The ball must be kept low. An effort must be made to keep the ball below knee-level. If players are seen to be purposefully kicking the ball high, they may be penalized. No Stalling. If players are seen holding the ball or purposefully kicking the ball out of bounds, they can be penalized. Respect the Referee. Referees have the final say on all calls and have the power to kick players out for being disrespectful. Keep in mind: all penalty shots must be taken within 15 seconds of the whistle being blown. After 15 seconds, the team forfeits their right to take the penalty. The shooter is decided by the number of fouls the opposing team committed. The more fouls committed, the closer of a penalty shot is allowed. In most cases, the foul count will only be one or two. ​Foul count of 1-2: The goalie shoots the penalty kick. ​Foul count of 3-5: The mid-field shoots the penalty kick. ​Foul count exceeding 6: The forwards take the penalty kick. ​​​How To Take The Penalty Shot? ​To begin all players must freeze in the field. ​After players are frozen, the referee will present the kicker with the ball. ​The kicker will then move and choose a position from which to shoot. All other players (including the opposing goalie) must remain stationary until ball stops. ​​​​​The referee will then sound his whistle and indicate whether the game can continue from the balls current position or whether a reset will occur. For those who prefer not to construct a field, many event rental organizations can rent out blow-up fields. These are great for kids or those who don't have time to build an official field. If you do wish to take on the task of constructing a foosball field, then this section is for you! 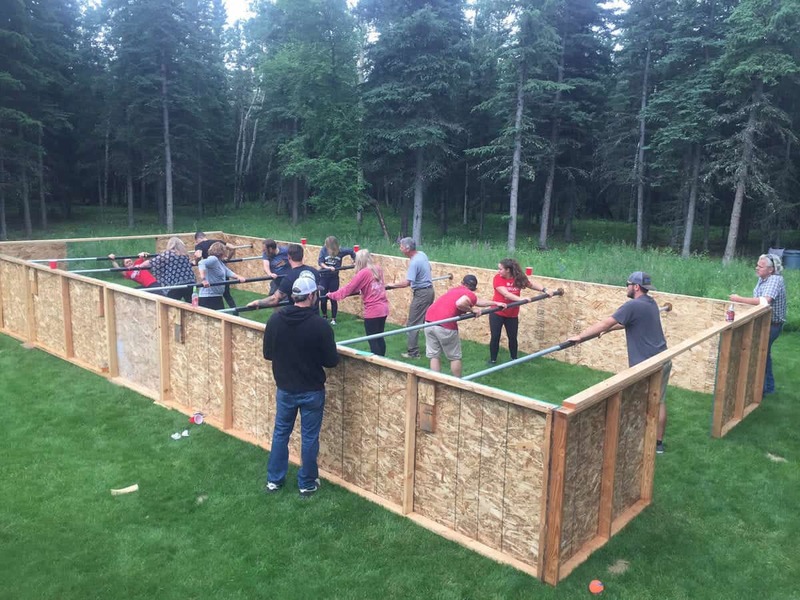 Regulation human foosball uses a 14-foot by 35-foot field. The goals are 6-feet wide and take up the middle of the 14-foot sides. Player rods are spaced 5 feet apart, and each player position on the rod is about 3 feet wide. Once you've decided whether to use regulation dimensions or if you prefer to use your own, calculate the total length of the rectangle, and then gather enough plywood to lay out length-wise. Then use 2 x 4's to create triangular backing supports for the plywood. If it is a permanent installment, consider screwing the plywood panels together for sturdiness. This process concludes the rectangle. Next, you will need to cut goals out. The goals should be directly in the middle of opposing sides and should be 2 feet high with a width that corresponds to the length of the side. It's best to cut these out with a circular saw. Once cut, you can leave them as empty goal slots, or if you're feeling fancy, you can staple a net around the hole to catch the ball. Finally you will need the rods. Once you decide upon the spacing and how many rods, you will need to use a hole-cutting bit to drill holes about 4 inches wide into corresponding sides of the court. These will be the holes which your rods slide through. Make sure the holes line up in this step. You wouldn’t want a crooked playing field! The final step is to make the rods. You might be able to find a long wooden stick, but I suggest using PVC pipe since they are easy to connect and disconnect. Make sure each rod is long enough so that it sticks out an additional 3-4 feet on each side when players are in the middle. This will allow for the necessary lateral movement. And there you have it! A basic homemade, human foosball court. It will cost less than $200, and take only a few hours to build if you have some help. If you've ever found yourself in a game-room with a foosball table and a couple of other people, then you know you're in for a great time. Complete strangers can connect and play for hours at a time. That's the aim of human foosball. You get a bunch of people together, build a field, throw in a soccer ball, have hours worth of fun, and maybe walk away with a few new friends. It doesn’t get too much better than that. So what are you waiting for? Get out there and give it a try!